History Books Memoirs, Biographies, Centennials and More! Good Book Design – What are its Elements? Jon Climie picking up his newly printed book, “Rescue”. Self Published Authors Testimonial -Jon Climie and “Rescue” by First Choice Books – Our Authors Rock! I recently completed a 470 page novel called ‘RESCUE’ that I had published by First Choice Books in Victoria, British Columbia, and wanted to comment on their exceptional service and the guidance they provided at every step of getting my novel printed. Like most other people on the journey of writing something, I eagerly awaited that first moment when I’d put a completed copy of it into someone else’s hands. It was that hope that fought back the covers as I stumbled out of bed for yet another early morning of writing. It was going to be a great book. It wouldn’t simply be another book among the thousands already on the shelves, but instead would be an inspiring statement of who I am. And evidence of the creative spirit within me. First Choice Books gets that. They understand what we, as writers, are attempting with our writing. Far from feeling like a business relationship, I felt like they’d pulled on a life jacket and grabbed a paddle, gotten into the canoe with me, and we were attacking the rapids together. Actually, publishing a first book is probably more akin to going over Niagara Falls in a barrel! I had a thousand questions every day, and I was very concerned that the nice young lady they’d assigned to my project would grow weary of them. She didn’t. I was concerned that some of my questions would highlight my lack of technical abilities. I’m sure they did, but she was always gracious and would explain in even greater detail how to accomplish what I needed to do. Within hours of my questions there’d be a set of email responses that helped carry me closer to my goal of publishing. And her responses were always upbeat and positive, encouraging me to continue on. But I would say that the best thing about First Choice Books would be that they never tried to cram my book into some sort of a cookie-cutter template that allowed them to crank it out as fast as possible. I wanted something that was me, and they didn’t stop making changes in the format and layout until I was completely satisfied. And their attitude always reflected the hope that my book would be exactly what I hoped for. What I’d dreamed about. Until that Monday in November of 2011, when I was able to open the box that held the culmination of my hopes, and grip in my hand a copy of my own first novel. I was beyond ecstatic, as I’m sure all first-time authors are. First Choice Books was the right choice―the excellent choice―for me. I don’t know if I really want to include this part, and maybe it doesn’t relate to most of the people who are self-publishing, so I’ll stick it down here where it can be edited out. I think most writers understand the odds of ever selling the manuscript they’re working on. The odds are staggeringly against us. And usually by time you’re thinking of self-publishing, you’ve already played the long drawn out vicious game that is traditional publishing. And you’ve already gotten two or three rooms wall-papered with rejection letters from dozens of agents and a host of publishers. I’m someone who knows the sting of those letters. There are lots of self-publishing companies all over the country. The internet is loaded with them. Most offer you a package of some description, where for a certain sum, they promise, they’ll provide you with everything you need to start selling your book. My concern is that they’re selling you a box of air. If you need convincing of their real intentions, ask them for a copy of the legal contract that you’ll need to sign. Now read through it really carefully. Who stands to benefit the most from this contract, regardless of how your book sells? I looked into lots of them. I can assure you that regardless of how your book is received, they’re taking their money out first, and the contract guarantees that. They don’t have a package they’re trying to sell you. And neither do they have a contract for you to sign. They’re interested in giving you the best book possible. They’ll work closely with you to publish the very best reflection of your creativity. You’ll enjoy the process, and the people, and in the end you’ll have a great book. And you won’t have bought a bunch of air that’s legally protected by a lengthy contract. I’m sorry to have included this if it offends you. I’m an author, and I wrote the hundred and forty-five thousand words it took to qualify as such. But I know that out beyond those walls are predators who will try to benefit from my hard work. And from your hard work. I considered several online self-publishers. Read their contracts. And then chose First Choice Books. 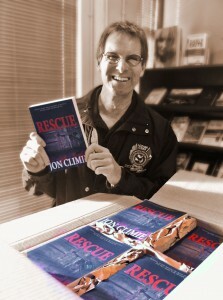 Jon Climie, author of RESCUE. Get started with self publishing your book! 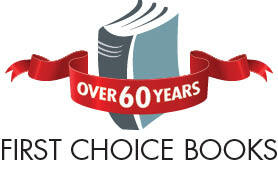 First Choice Books is part of a more than 60-year-old independently-owned and operated company. Read more about us. Sleeking-Lamination – Add Bling To Your Digital Design! TEDtalks – Are They in Your Marketing Plan? Mon-Fri 8-4:30 PST or by appt.